This movie had played in Indonesian cinemas since 27 March and it was quite a surprise for me that it premiered on a Tuesday. But then I realized it must have been due to a major new movie i.e. Ready Player One playing on Wednesday. My wife and I just wanted to give this one a try since we were not having any plans that night. I saw the trailer few weeks earlier and I thought the premise seemed interesting. So here goes more on the movie. When a category 5 hurricane was going to hit a small city in the US, the town's sheriff Dixon (Ben Cross - Chariots of Fire etc) decided to evacuate the people to safety as he wanted to avoid having a big catastrophe like they suffered years earlier. Will (Toby Kebbell - Ben-Hur, A Monster Calls etc) a meteorologist who was in the area investigating the hurricane believed that it was going to be very huge and may even be larger than the forecast. He was worried that his older brother Breeze (Ryan Kwanten - True Blood TV series etc) would not make it out of the city and decided to return there to encourage him to leave. Meanwhile, a Treasury Agent named Casey (Maggie Grace - Aftermath, Taken trilogy etc) together with a fellow agent Perkins (Ralph Ineson - Harry Potter and The Deathly Hallows etc) were delivering trucks full of old American bills to be destroyed in the government facility located inside that city. This would be when the things got complicated, as some people specifically came to the city to rob the cash during the time when not many people were around due to the hurricane. With the unlikely help from Will and his brother Breeze, Casey had no choice but to fight the robbers and save themselves from the major hurricane about to destroy the city. After seeing this movie, I thought it was quite average. It was not a great movie, but it was not a very very bad one either. 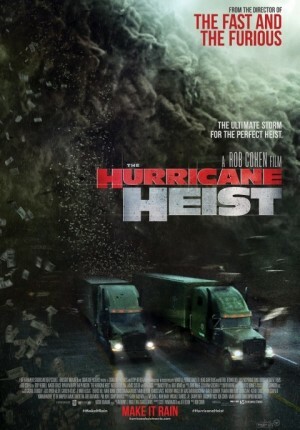 I think the plot was quite smart by combining heist with a disaster story. However, as it was a combination of disaster and heist, there should not be any expectation of dramatic moments which normally would accompany such genre. Instead we would be provided with more suspenseful moments involving the heist itself. What I liked about this movie was their attention to details. There were moments where I thought the film maker was quite thorough about the small stuff, such as the parabolic antenna on the special car owned by Will or the buffering of video call, the guns running out of ammo and so on. These were usually the parts where movie makers seldom take time to address. The movie also had some brief funny moments (even though they were a bit cheesy). Of course the part which was rather disappointing was the CGI effects that were not great at times and the sound effects that were not spectacular. For this kind of movie, great sound effects could be a real plus point that would satisfy my enjoyment. The 3 main characters here, i.e. Toby Kebbell, Maggie Grace and Ryan Kwanten were having quite good chemistry and rather nice to see. Ryan's Southern accent made him really believable as a small town man (as I remembered from his time in True Blood), while Maggie was able to portray a different type of personality as opposed to the girl who must be saved in Taken trilogy but I personally felt Toby was not really convincing as the man from Southern America, though he was OK as a meteorologist. Other supporting characters that stood out would definitely be Ralph Ineson as Agent Perish, while the rest did not seem to be too memorable to me. This movie also had few interesting surprising twists to add to the suspense. And there were moments where it was pretty intense, especially in the middle where my wife would really felt quite tensed. Overall, I could certainly understand if this movie did not appeal to general audience, as it was too light, having no major Hollywood stars in it, a bit cheesy & might be considered illogical and having unspectacular CGI effects (as the time of my writing, the movie would be considered a commercial failure and not surprisingly trashed by critics). But I personally still could enjoy it a bit, while waiting for a bigger blockbuster movie coming soon. So if you are looking for a rather light heist combined with disaster movie, then this one could be given a try. It's still playing in the largest cinema chain in Indonesia. As long as you avoid seeing the trailer first as it revealed too much information and plot. However, if you are looking for a pure disaster movie (with beautiful & convincing special effects), or pure intelligent heist movie, then this one might not be to your liking. The choice is yours.